Nobody hands still take the lead because right now it’s just a design study developed by Spirit of the Seventies, British preparer that has carved its name-based customizations which meeting point is its 70s flavor. 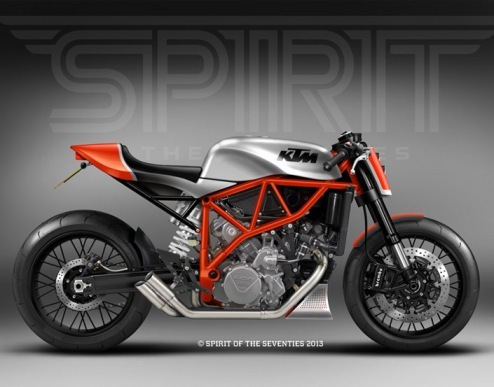 Its latest creation is the KTM LC8 Special Spirit of the Seventies, a little time travel created around the ineffable engine of the Austrian firm. Kevin Taggart and Tim Rogers are the names behind the project. Co-owners of Spirit of the Seventies share a strong passion for these cafe racers, flat tracker scrambler or how well they get recall the seventies of the last century. At some point they decided to put their talents to creating bikes that fascination vintage style completely based on modern machines like the Triumph Daytona 675 and Bonneville, Ducati as the 749R, Hypermotard 1100 GT and Sport Classic, and also Japanese bikes like the Kawasaki W800. Nor do it averse to working with older models like the Yamaha XS650 and SR 400, the Honda CB and VT500 or the Kawasaki Z1000 and Z750. The common denominator of their work is, in any case, that the customization has to be respectful of the culture of origin marking.